So we purchased Stern Pinball Arcade on the Playstation 4 since the PR and Marketing department representing this game failed us. I finally got time to play this game with ten pinball tables. There is supposed to be an eleventh (Ghostbusters Premium) table, but I don’t know if it will be paid DLC, or free. The ten tables in Stern Pinball Arcade are Star Trek Vengeance Premium, AC/DC Premium, Mustang Premium Boss, Harley Davidson Third Edition, Last Action Hero, Mary Shelley’s Frankenstein, Starship Troopers, High Roller Casino, Ripley’s Believe it or Not, and Phantom of the Opera. The amount of tables in this physical copy version of this home console video game is impressive. 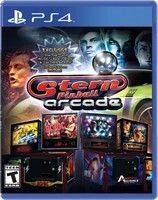 I like seeing games like Stern Pinball Arcade receiving the physical copy treatment. Stern Pinball Arcade does a good job of emulating these tables. There is also history on the tables, along with things like fliers for them. There are leaderboards so you can see where your score ranks with the rest of the people who have played this game across multiple platforms. The loading is generally okay. I felt like it took too long loading all of the tables. So with ten tables there is all kinds of variety. I noticed some tables have massively high scores, and others are much lower. Some tables are designed to keep the ball in play, and others like to have you lose the ball quickly. It ranges in Stern Pinball Arcade. There should be enough tables for families to get their moneys worth out of Stern Pinball Arcade. I will have a review for this game in issue #119 of the Family Friendly Gaming magazine and e-magazine.